Dating back to around 100 B.C. Roman coinage is one of the most popular areas of the ancient coin market. Ancient Gold Coins a division of Austin Rare Coins is one of the premier ancient coin dealers in the United States, and we specialize in high-end ancient coins that have been certified and authenticated by NGC Ancients, the top ancient coin grading corporation in the business. Coinage from this era, even though these coins were struck over 2,000 years ago, is a tangible and impressive reminder of the greatness of Rome. Coinage was not only struck as a means for commerce but also as propaganda to spread messages of their current leader across the vast empire. The primary coins of the era were the Gold Aureus, the Silver Denarius, and copper coins of various sizes. Typically Roman coinage had an image of the emperor on the obverse with varying reverses to tell a story or send a message. One of the most famous and desirable coins in human history the Ides Of March Silver Denarius, was struck by Brutus after he and others assassinated Julius Caesar on the steps of the Roman Capitol. Prices start as low as a hundred dollars for circulated more common issues, while higher-end rarities can bring five or six figures depending upon their quality and rarity. 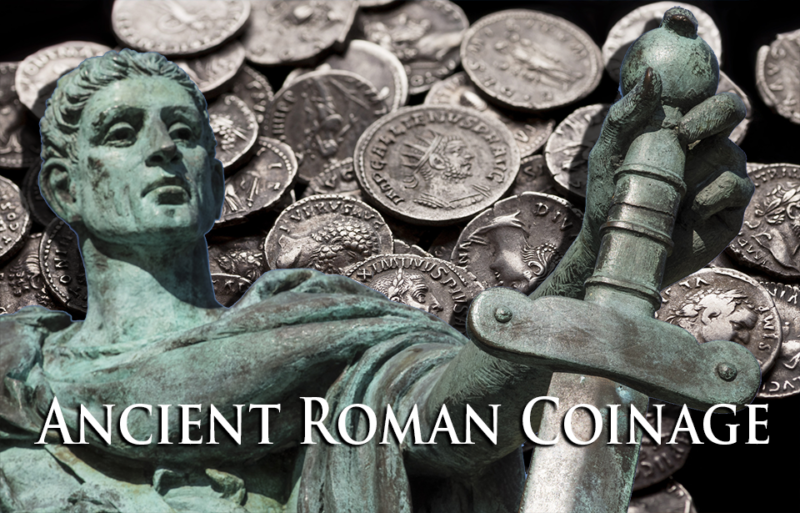 If you ‘re interested in learning more about Roman coinage, you should request our 8-page Ancient coin report. It is loaded with history, picture and description to give you a solid foundation of knowledge and ideas of how to go about collecting Roman Coinage .